The plugin is open source and weighs in at roughly 4KLOC of heavily-commented C++. Additionally, we are also releasing a helpful plugin for aspiring microcode plugin developers called the Microcode Explorer, which will also be distributed with the Hex-Rays SDK in subsequent releases. Thus far, the binary seems normal. However, nearly any function’s assembly and decompilation listings immediately tells a different tale, as shown in the figures at the top of this entry. We can see constants with high entropy, redundant computations that an ordinary compiler optimization would have removed, and an unusual control flow structure. That the same pattern appears repeatedly is an indication that the obfuscating compiler has a repertoire of patterns that it introduces into the code prior to compilation. Another note about the previous figure is that the topmost occurrence of the x*(x-1) & 1 pattern is inside of an if-statement with an AND-compound conditional. Given that this expression always evaluates to zero, the AND-compound will fail and the body of the if-statement will never execute. This is a form of obfuscation known as opaque predicates: conditional branches that in fact are not conditional, but can only evaluate one way or the other at runtime. Assign a number to each basic block. The obfuscator introduces a block number variable, indicating which block should execute. Each block, instead of transferring control to a successor with a branch instruction as usual, updates the block number variable to its chosen successor. The ordinary control flow is replaced with a switch statement over the block number variable, wrapped inside of a loop. Here’s the assembly language implementation of control flow flattening switch for a small function. The targets of these equality comparisons are the original function’s basic blocks. Each one updates var_1C to indicate which block should execute next, before branching back to the code just shown, which will then perform the equality comparisons and select the corresponding block to execute. 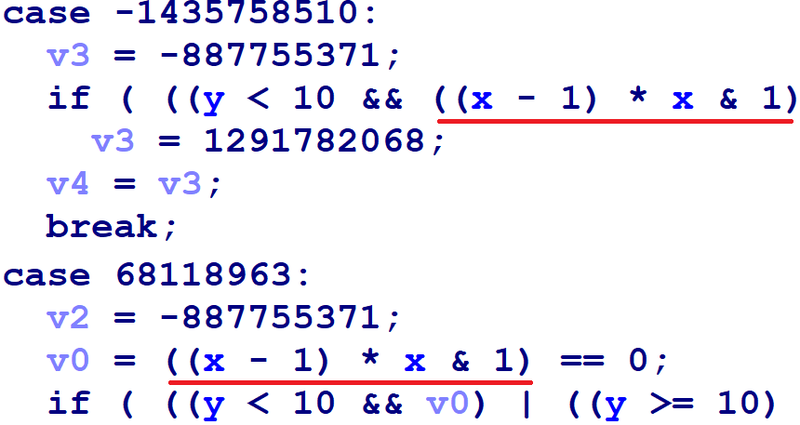 For blocks with one successor, the obfuscator simply assigns var_1C to a constant value, as in the following figure. In the figure above, the red and orange nodes are the switch-as-binary-search implementation. The blue nodes are the original basic blocks from the function (subject to further obfuscation). The purple node at the bottom is the loop back to the beginning of the switch-as-binary-search construct (the red node). Finally, we can also see that the obfuscator manipulates the stack pointer in unusual ways. Particularly, it uses __alloca_probe to reserve stack space for function arguments and local variables, where a normal compiler would, respectively, use the push instruction and reserve space for all local variables at once in the prologue. IDA has built-in heuristics to determine the numeric argument to __alloca_probe and track the effects of these calls upon the stack pointer. However, the output of the obfuscator leaves IDA unable to determine the numeric argument, so IDA cannot properly track the stack pointer. Aside: Where did this Binary Come From? I am not entirely sure how this binary was produced. Obfuscator-LLVM also uses pattern-based obfuscation and control flow flattening, but Obfuscator-LLVM has different patterns than this sample, and there are some superficial differences with how control flow flattening is implemented. Also, Obfuscator-LLVM does not generate opaque predicates, nor the alloca-related obfuscation. And, needless to say, the fact that the binary includes the Microsoft CRT and a RICH header is also puzzling. If you have any further information about this binary, please contact me. 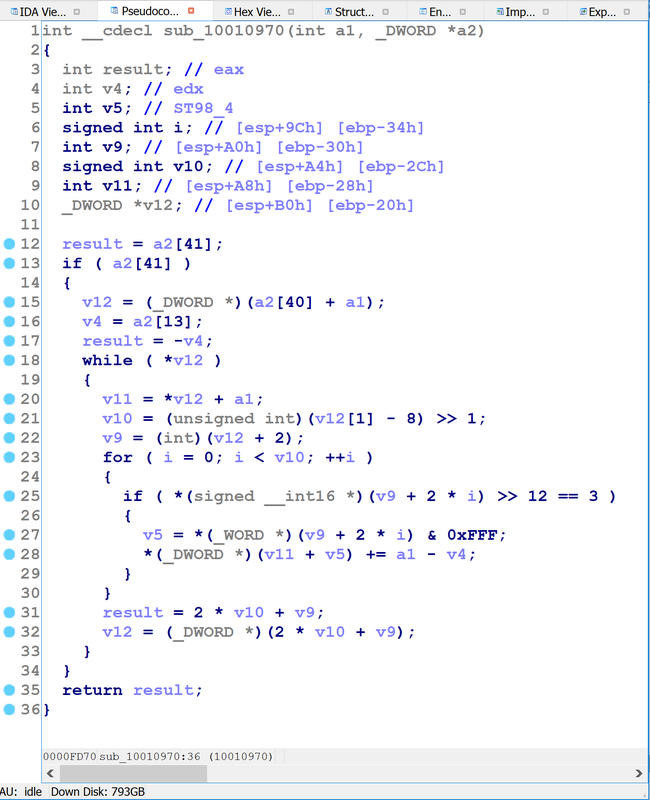 Update: following discussions on twitter with an Obfuscator-LLVM developer and another knowledgeable individual, in fact, the obfuscating compiler in question is Obfuscator-LLVM, which has been integrated with the Microsoft Visual Studio toolchain. The paragraph above falsely stated that Obfuscator-LLVM used different patterns and did not insert opaque predicates. The author regrets these errors. In theory, the plugin we develop in this entry might work for other binaries produced by the same compilation process, or even for Obfuscator-LLVM in general, but this theory has not been tested and no guarantees are offered. Now that we’ve seen the obfuscation techniques, let’s break them. A maxim I’ve learned doing deobfuscation is that the best results come from working at the same level of abstraction that the obfuscator used. For obfuscators that work on the assembly-language level, historically my best results have come in using techniques that represent the obfuscated code in terms of assembly language. For obfuscators that work at the source- or compiler internal-level, my best results have come from using a decompiled representation. So, for this obfuscator, a Hex-Rays plugin seemed among our best options. 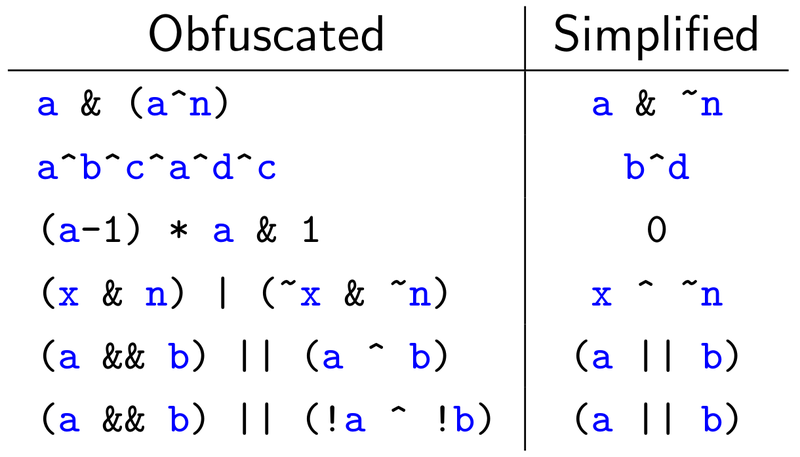 The first two techniques are implemented via pattern substitutions inside of the obfuscating compiler. 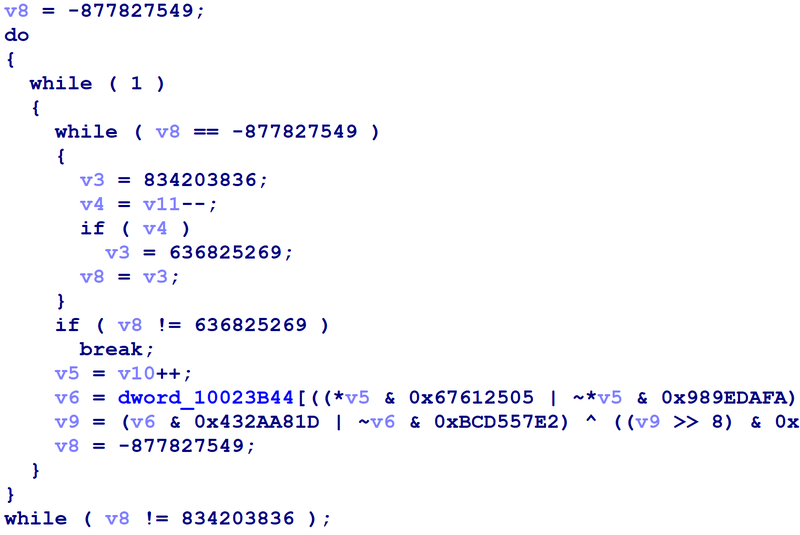 Pattern-based deobfuscation techniques, for all their downsides, tend to work well when the obfuscator itself employed a repertoire of patterns — especially a limited one — as seems to be the case here. So, we will attack these via pattern matching and replacement. The alloca-related stack manipulation is the simplest technique to bypass. The obfuscator’s non-standard constructs have thwarted IDA’s ordinary analysis surrounding calls to __alloca_probe, and hence the obfuscation prevented IDA from properly accounting for the stack differentials induced by these calls. To break this, we will let Hex-Rays do most of the work for us. For every function that calls __alloca_probe, we will use the API to decompile it, and then at every call site to __alloca_probe, we will extract the numeric value of its sole argument. Finally, we will use this information to create proper stack displacements within the disassembly listing. The code for this is very straightforward. As for control flow flattening, this is the most complicated of the transformations above. We’ll get back to it later. Though I later switched to the Hex-Rays microcode API, I started with the CTREE API, the one that has been available since the first releases of the Hex-Rays SDK. It is overall simpler than the microcode API, and has IDAPython bindings where the microcode API currently does not. The CTREE API provides a data structure representation of the decompiled code, from which the decompilation listing that is presented to the user is generated. Thus, there is a direct, one-to-one correspondence between the decompilation listing and the CTREE representation. For example, an if-statement in the decompilation listing corresponds to a CTREE data structure of type cif_t, which contains a pointer to a CTREE data structure of type cexpr_t representing the if-statement’s conditional expression, as well as a pointer to a CTREE data structure of type cinsn_t representing the body of the if-statement. We will need to know how our patterns are represented in terms of CTREE data structures. To assist us, the VDS5 sample plugin from the Hex-Rays SDK helpfully displays the graph of a function’s CTREE data structures. 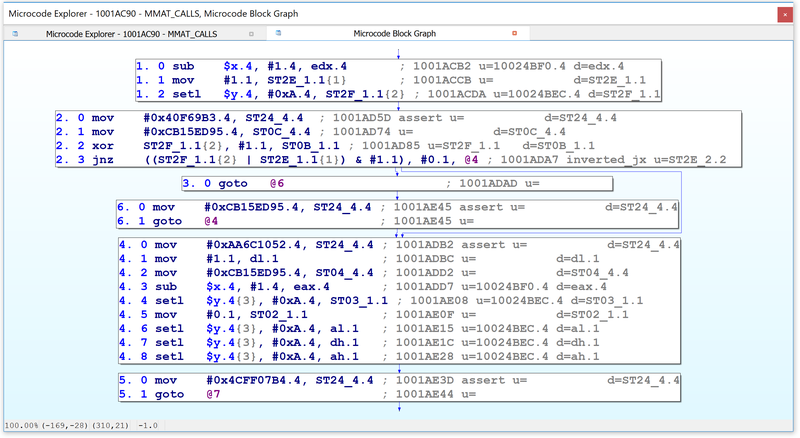 (The third-party plugin HexRaysCodeXplorer implements this functionality in terms of IDA’s built-in graphing capabilities, whereas the VDS5 sample uses the external WinGraph viewer.) The following figure shows decompilation output (in the top left) and its corresponding CTREE representation in graphical form. Hopefully, the parallels between them are clear. The only point of subtlety in replacing obfuscated CTREE elements with deobfuscated equivalents is that each CTREE expression has associated type information, and we must carefully ensure that our replacements are of the proper type. The easiest solution is simply to copy the type information from the CTREE expression we’re replacing. Cataloging the patterns and writing match and replace functions for them was straightforward. However, after having done so, the decompilation showed obvious opportunities for improvement by application of standard compiler optimizations, as shown in the following animation. This perplexed me at first. I knew that Hex-Rays already implemented these compiler optimizations, so I was confused that they weren’t being applied in this situation. Igor Skochinsky suggested that, while Hex-Rays does indeed implement these optimizations, that they take place during the microcode phase of decompilation, and that these optimizations don’t happen anymore once the CTREE representation has been generated. Thus, I would either have to port my plugin to the microcode world, or write these optimizations myself on the CTREE level. I set the issue aside for the time being and continued with the other parts of the project. Next, I began working on the control flow unflattening portion. I envisioned this taking place in three stages. My final solution included none of these steps, so I won’t devote a lot of print space to my early plan. But, I’ll discuss the original idea, and the issues that lead me to my final solution. Starting from the switch-as-binary-search implementation, rebuild an actual switch statement (rather than a mess of nested if and goto statements). Examine how each switch case updates the block number variable to recover the original control flow graph. I.e., each update to the block number variable corresponds to an edge from one block to its numbered target. Given the control flow graph, reconstruct high-level control flow structures such as loops, if/else statements, break, continue, return, and so on. I began by writing a CTREE-based component to reconstruct switch statements from obfuscated functions. The basic idea — inspired by the assembly language implementation — is to identify the variable that represents the block number to execute, find equality comparisons of this variable against constant numbers, and extract these numbers (these are the case labels) as well the address of the code that executes if the comparison matches (these are the bodies of the case statements). This proved more difficult than I expected. Although the assembly language implementations had a predictable structure, Hex-Rays had applied transformations to the high-level control flow which made it difficult to extract the information I was after, as we can see in the following figure. We see above the introduction of a strange while loop in the inner switch, and the final if-statement has been inverted to a != conditional rather than a == conditional, which might seem a more logical translation of the assembly code. The example above doesn’t show it, but sometimes Hex-Rays rebuilds small switch statements that cover portions of the larger switch. Thus, our switch reconstruction logic must take into account that these transformations might have taken place. For ordinary decompilation tasks, these transformations would have been valuable improvements to the output; but in my unusual situation, it meant my switch recovery algorithm was basically fighting against these transformations. My first attempt at rebuilding switches had a lot of cumbersome corner cases, and overall did not work very well. Still, I pressed on. I started thinking about how to rebuild high-level control flow structure (if statements, while loops, returns, etc.) from the recovered control flow graph. While it seemed like a fun challenge, I quickly realized that Hex-Rays obviously already includes this functionality. Could I re-use Hex-Rays’ existing algorithms to do that? Another conversation with Igor lead to a similar answer as before: in order to take advantage of Hex-Rays’ built-in control flow structuring algorithms, I would need to operate at the microcode level instead of the CTREE level. At this point, all of my issues seemed to be pointing me toward the newly-available microcode API. I bit the bullet and started over with the project using the microcode API. My first order of business was to read the SDK’s hexrays.hpp, which now includes the microcode API. I’ll summarize some of my findings here; I have provided some more, optional information in an appendix. At Igor’s suggestion, I compiled the VDS9 plugin included with the Hex-Rays SDK. This plugin demonstrates how to generate microcode for a given function (using the gen_microcode() API) and print it to the output window (using mbl_array_t::print()). 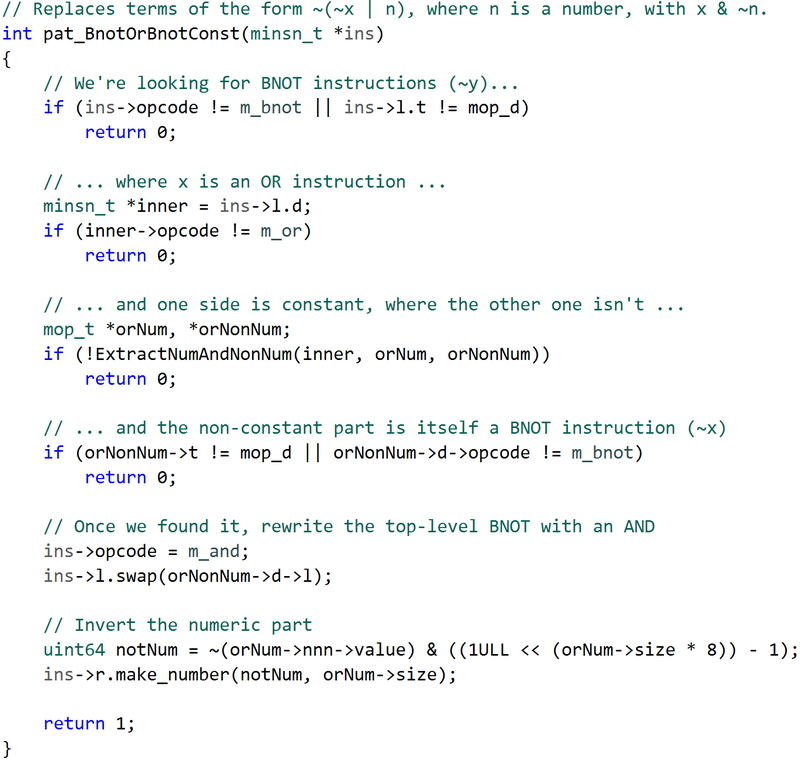 mop_t, operands for microcode instructions. mbl_array_t, which contains the graph for the microcode function. mblock_t, the basic blocks within the microcode graph, which contain the instructions, and the edges between the blocks. As Hex-Rays internally optimizes and transforms the microcode, it moves through so-called “maturity phases”, indicated by an enumerated element of type mba_maturity_t. For example, immediately after generation, the microcode is said to be at maturity MMAT_GENERATED. 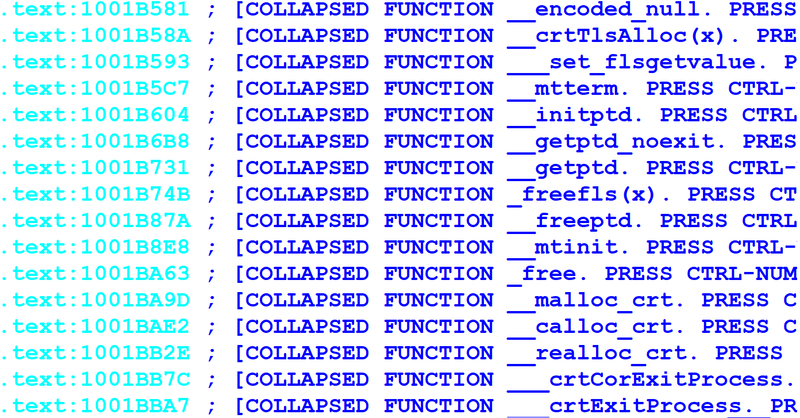 After local optimizations have been performed, the microcode moves to maturity MMAT_LOCOPT. After performing analysis of function calls (such as deciding which pushes onto the stack correspond to which called function), the microcode moves to maturity MMAT_CALLS. When generating microcode via the gen_microcode() API, the user can specify the desired maturity level to which the microcode should be optimized. Examining the microcode at various levels of maturity is an informative and impressive undertaking that I recommend for all would-be microcode API plugin developers. It sheds light on which transformations take place in which order, and the textual output is easy to comprehend. At the start of this project, I spent a good bit of time reading through microcode dumps at various levels of maturity. 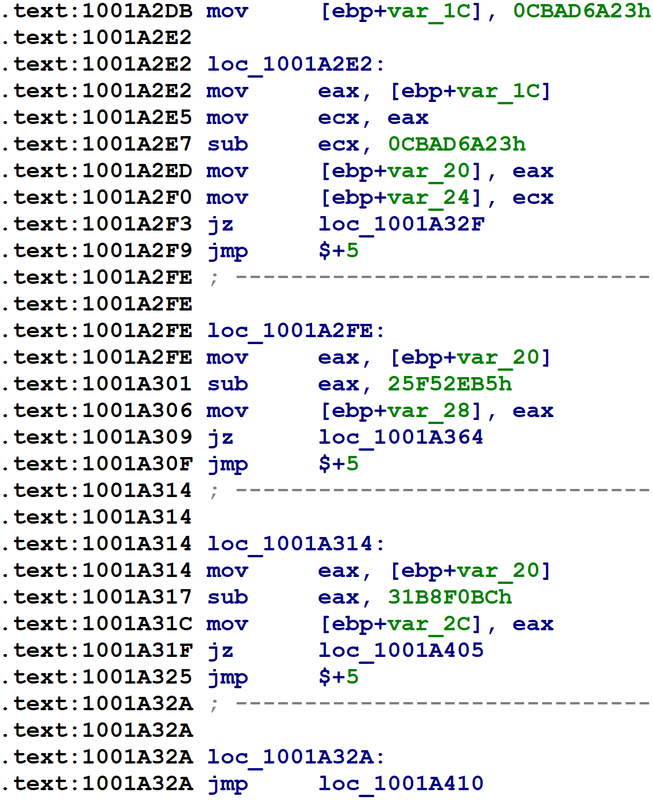 Though the microcode dump output is very nice and easy to read, its output does not show the low-level details of how the microcode instructions and operands are represented — which is critical information for writing microcode plugins. As such, to understand the low-level representation, I wrote functions to dump minsn_t instructions and mop_t operands in textual form. 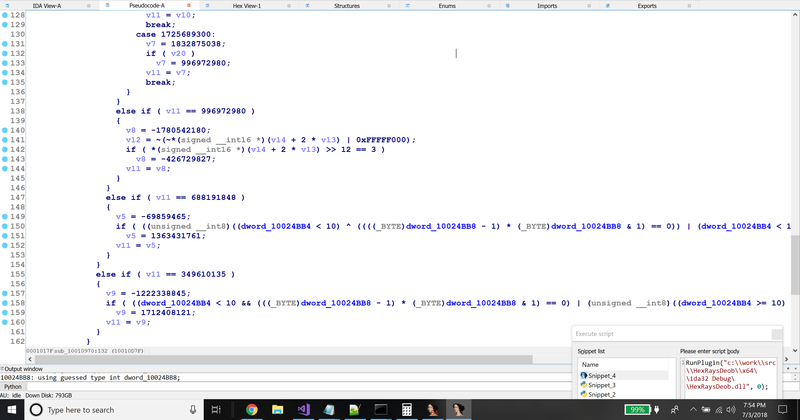 Once the user makes a selection, the plugin shows a custom viewer in IDA with the microcode dump at the selected maturity level. 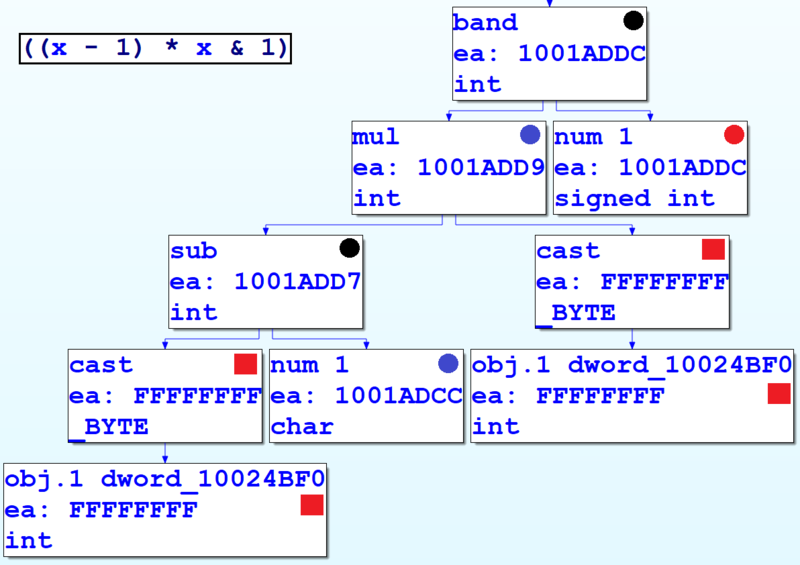 Second, the Microcode Explorer can display the graph for a selected microinstruction and its operands, akin to the VDS5 plugin we saw earlier which displayed a graph of a function’s CTREE representation. Simply position your cursor on any line in the viewer and press the I key. The appendix discusses the microcode instruction set in more detail, and I recommend that aspiring microcode API plugin developers read it. Once I had a basic handle on the microcode API instruction set, I began by porting my CTREE-level pattern matching and replacement code to the microcode API. This was more laborious due to the more elaborate nature of the microcode API, and the fact I had to write it in C++ instead of Python. All in all, the porting process was mostly straightforward. 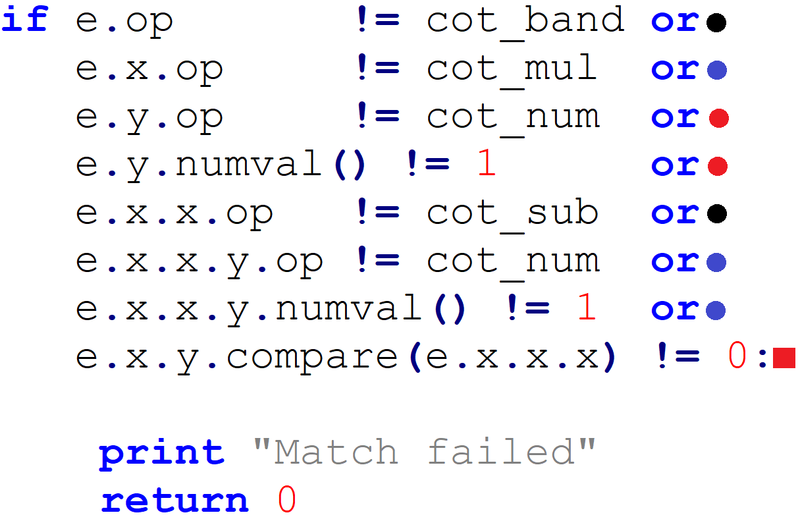 The code can be found here, and here’s an example of a pattern match and replacement. 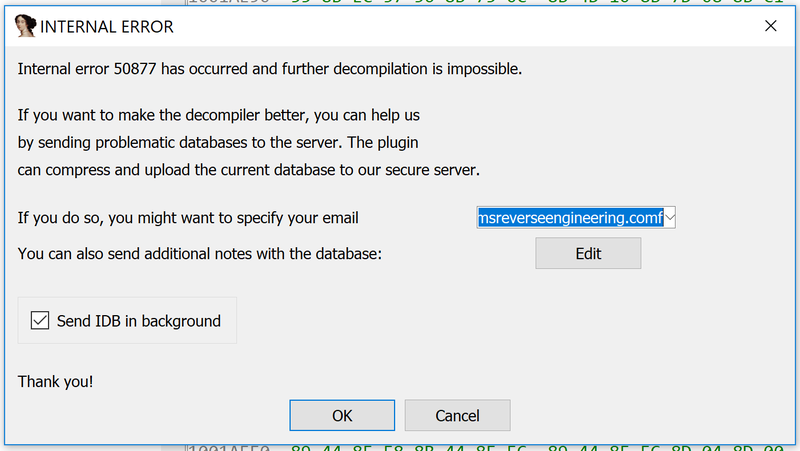 Also, I needed to know how to integrate my pattern replacement with the rest of Hex-Rays’ decompiler infrastructure. It was easy enough to write and test my pattern replacement code against the data returned by the gen_microcode() API, but doing so has no effect on the decompilation listing that the user ultimately sees (since the decompiler calls gen_microcode() internally, and we don’t have access to the mbl_array_t that it generates). The VDS10 SDK sample illustrates how to integrate pattern-replacement into the Hex-Rays infrastructure. In particular, the SDK defines an “instruction optimizer” data type called optinsn_t. The virtual method optinsn_t::func() is given a microinstruction as input. That method must inspect the provided microinstruction and try to optimize it, returning a non-zero value if it can. Once the user installs their instruction optimizer with the SDK function install_optinsn_handler(), their custom optimizer will be called periodically by the Hex-Rays decompiler kernel, thus achieving integration that ultimately affects the user’s view of the decompilation listing. You may recall that a major impetus for moving the pattern-matching to the microcode world was that, after the replacements had been performed, Hex-Rays had an opportunity to improve the code further via standard compiler optimizations. We showed what we expected the result of such optimizations would be, but no optimizations had been applied when we wrote our pattern-replacement with the CTREE API. By moving to the microcode world, now we do get the compiler optimizations we desire. That’s exactly the result we had been expecting. Great! I didn’t have to code those optimizations myself after all. When we wrote our CTREE pattern matching and replacement code, we targeted a specific CTREE maturity level, which lead to predictable CTREE data structures implementing the patterns. In the microcode world, as discussed more in the appendix, the microcode implementation changes dramatically as it matures. 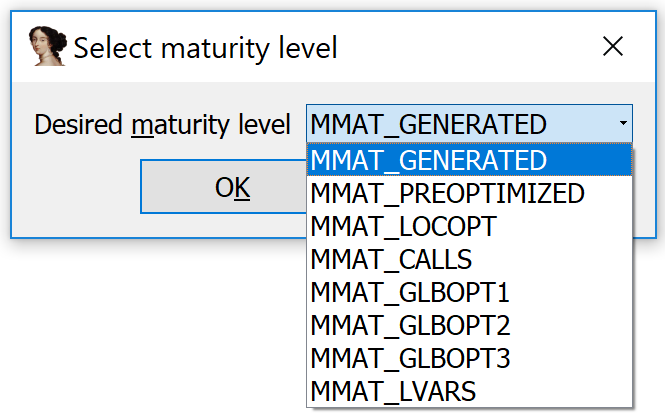 Furthermore, our instruction optimizer callback gets called all throughout the maturity lifecycle. Some of our patterns won’t yet be ready to match at earlier maturity phases; we’ll have to write our patterns targeting the lowest maturity level at which we can reasonably match them. While porting my CTREE pattern replacement code to the microcode world, at first I also adopted my strategy from the CTREE world of generating my pattern replacement objects from scratch, and inserting them into the microcode atop the terms I wanted to replace. However, I experienced a lot of difficulty in doing so. Since I was new to the microcode API, I did not have a clear mental picture of what Hex-Rays internally expected about my microcode objects, which lead to mistakes (internal errors and a few crashes). I quickly switched strategies such that my replacements would modify the existing microinstruction and microoperand objects, rather than generating my own, which reduced my burden of generating correct minsn_t and mop_t objects (since this strategy allowed me to start from valid objects). To recap, control flow flattening eliminates direct block-to-block control flow transfers. The flattening process introduced a “block number variable” which determines the block that should execute at each step of the function’s execution. Each flattened function’s control flow structure has been changed into a switch over the block number variable, which ultimately shepherds execution to the correct block. Every block must update the block number variable to indicate the block that should execute next after the current one (where conditional branches are implemented via conditional move instructions, updating the block number variable to the block number of either the taken branch, or of the non-taken branch). The control flow unflattening process is conceptually simple. Put simply, our task is to rebuild the direct block-to-block control flows, and in so doing, eliminate the control flow switch mechanism. Implementation-wise, unflattening is integrated with the Hex-Rays decompiler kernel in a similar fashion to how we integrated pattern-matching. Specifically, we register an optblock_t callback object with Hex-Rays, such that our unflattener will be automatically invoked by the Hex-Rays kernel, providing a fully automated experience for the user. The next chapter will discuss the implementation in more depth. In the following subsections, we’ll show an overview of the process pictorially. Just three steps are all we need to remove the control flow flattening. Once we rebuild the original control flow transfers, all of Hex-Rays’ existing machinery for control flow restructuring will do the rest of the work for us. This was perhaps my favorite result from this project; all I had to do was re-insert proper control flow transfers, and Hex-Rays did everything else for me automatically. We can see on line 9.4 that this block updates the block number variable to 0xCBAD6A23, before executing a goto back to the control flow switch (on the Hex-Rays block numbered @2). From what we learned in step #1, we know that, by setting the block number variable to this value, the next trip through the control flow switch will execute the Hex-Rays mblock_t numbered @6. The second case is when a block has two possible successors, as does Hex-Rays block @6 in the following figure. Line 8.0 updates the block number variable with the value of eax, before line 8.1 executes a goto back to the control flow switch at Hex-Rays block @2. 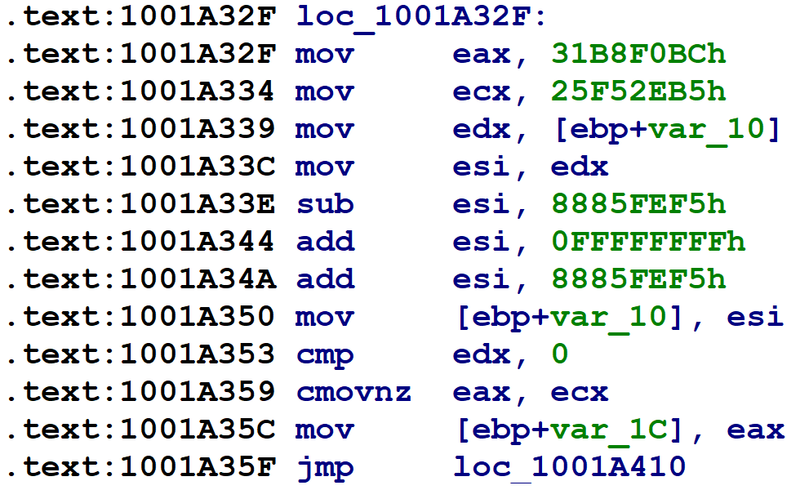 If the jz instruction on line 6.4 is taken, then eax will have the value 0x31B8F0BC (obtained on line 6.1). If the jz instruction is not taken, then eax will contain the value 0x25F52EB5 from the assignment on line 7.0. Consulting the information we obtained in step #1, this block will transfer control to Hex-Rays block @10 or @9 during the next trip through the control flow switch. Finally, now that we know the Hex-Rays mblock_t numbers to which each flattened block shall pass control, we can modify the control flow instructions in the microcode to point directly to their successors, rather than going through the control flow switch. If we do this for all flattened blocks, then the control flow switch will no longer be reachable, and we can delete it, leaving only the function’s original, unflattened control flow. The case where a block has two potential successors is slightly more complicated, but the basic idea is the same: altering the existing control flow back to the control flow switch to point directly to the Hex-Rays targeted blocks. Here’s Hex-Rays block @6 again, with two possible successors. Copy the instructions from block @8 onto the end of block @7. Change the goto instruction on block @7 (which was just copied from block @8) to point to block @9 (since we learned in step #1 that 0x25F52EB5 corresponds to block @9). 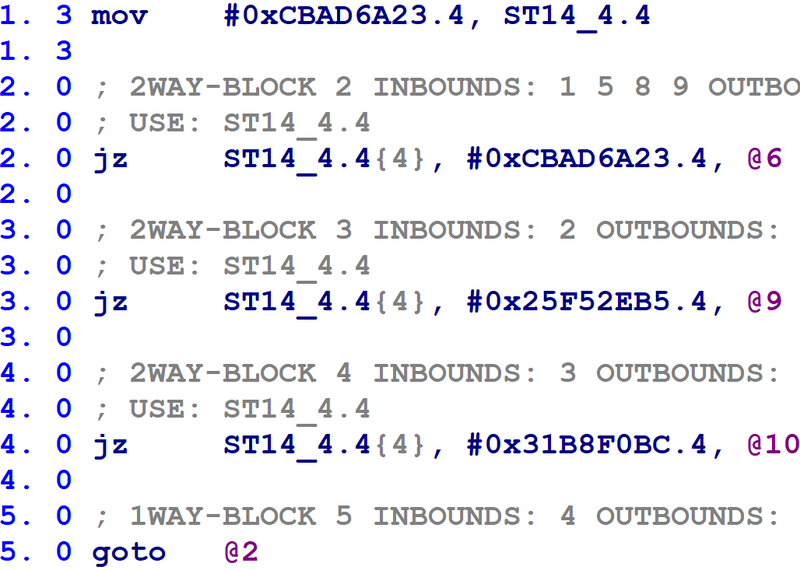 Update the goto target on block @8 to block @10 (since we learned in step #1 that 0x31B8F0BC corresponds to block @10). We can also eliminate the update to the block number variable on line 8.0, and the assignments to eax on lines 6.1 and 7.0. That’s it! As we make these changes for every basic block targeted by the control flow switch, the control flow switch dispatcher will lose all of its incoming references, at which point we can prune it from the Hex-Rays microcode graph, and then the flattening will be gone for good. As always, the real world is messier than curated examples. The remainder of this section details the practical engineering considerations that go into implementing unflattening as a fully-automated procedure. It turns out that a few non-library functions within the binary were not flattened. I had enough work to do simply making my unflattening code work for flattened functions, such that I did not need the added hassle of tracking down issues stemming from spurious attempts to unflatten non-flattened functions. With that characterization, the algorithm for heuristically determining whether a function was flattened practically wrote itself. Iterate through all microinstructions within a function. For this, the SDK handily provides the mbl_array_t::for_all_topinsns function, to be used with a class called minsn_visitor_t. For every jz and jg instruction that compares a variable to a number, record that information in a list. After iteration, choose the variable that had been compared against the largest number of constants. Perform an entropy check on the constants. In particular, count the number of bits set and divide by the total number of bits. If roughly 50% of the bits were set, decide that the function has been flattened. You can see the implementation in the code — specifically the JZInfo::ShouldBlacklist() method. The flattened functions sometimes have jumps leading directly to other jumps, or sometimes the microcode translator inserts goto instructions that target other goto instructions. 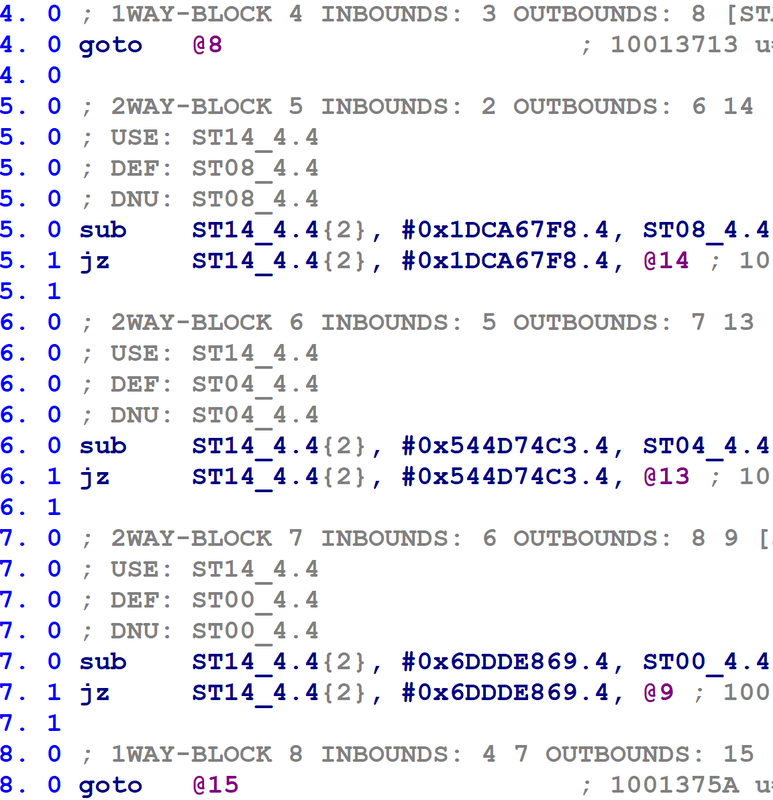 For example, in the following figure, block 4 contains a single goto instruction to block 8, which in turn has a goto instruction to block 15. These complicate our later book-keeping, so I decided to eliminate goto-to-goto transfers. I.e. if block @X ends with a goto @N instruction, and block @N contains a single goto @M instruction, update the goto @N to goto @M. In fact, we apply this process recursively; if block @M contained a single goto @P, then we would update goto @N to goto @P, and so on for any number of chained gotos. The Hex-Rays SDK sample VDS11 does what was just described in the last paragraph. My code is similar, but a bit more general, and therefore a bit more complicated. 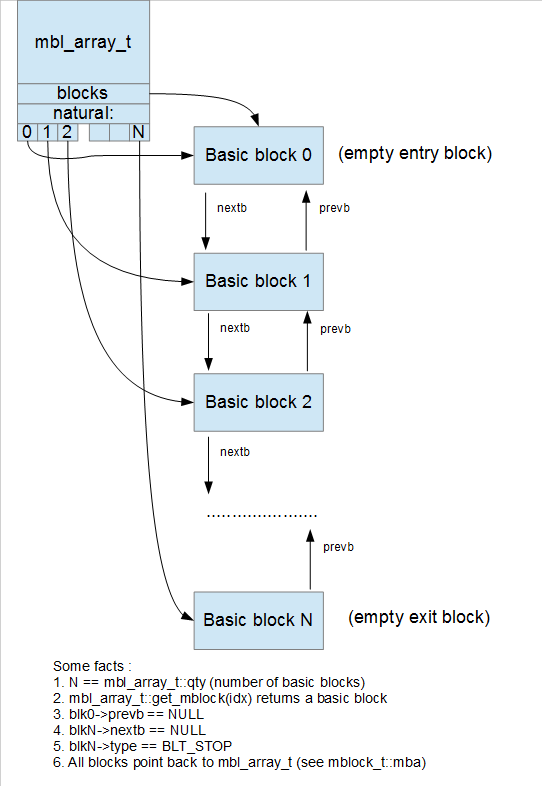 It also handles the case where a block falls through to a block with a single goto — in this case, it inserts a new goto onto the end of the leading block, with the same destination as the original goto instruction in the trailing block. When heuristically determining whether a function appears to have been flattened, we already found the variable with the most conditional comparisons, and the numbers it was compared against. Are we done? No — because as usual, there are complications. Many of the flattened functions use two variables, not one, for block number-related purposes. For those that use two, the function’s basic blocks update a different variable than the one that is compared by the control flow switch construct. I call this the block update variable. and I renamed my terminology for the other one to the block comparison variable. Toward the beginning of the control flow switch, the value of the block update variable is copied into the block comparison variable, after which all subsequent comparisons reference the block comparison variable. In the above, block @1 is the function’s prologue. The control flow switch begins on block @2. Notice that block @1 assigns a numeric value to a variable called ST18_4.4. Note that the first comparison in the control flow switch, on line 2.3, compares against this variable. Note also that line 2.1 copies that variable into another variable called ST14_4.4, which is then used for the subsequent comparisons (as on line 3.1, and all control flow switch comparisons thereafter). Determine which variable is the block comparison variable (which we already have from the entropy check). Determine if there is a block update variable, and if so, which variable it is. Extract the numeric constants from the jz comparisons against the block comparison variable to determine the flattened block number to Hex-Rays mblock_t number mapping. I quickly examined all of the flattened functions to see if I could find a pattern as to how to locate the block update variable. It was simple enough: for any variable assigned a numeric constant value in the first block, see if it is later copied into the block comparison variable. There should be only one of these. It was easy to code using similar techniques to the entropy check, and it worked reliably. The code for reconstructing the flattened Hex-Rays block number mapping is nearly identical to the code used for heuristically identifying flattened functions, and so we don’t need to say anything in particular about it. From the above, we now know which variable is the block update variable (or block comparison variable, if there is none). We also know which flattened block number corresponds to which Hex-Rays mblock_t number. For every flattened block, we need to determine the number to which it sets the block update variable. We walk backwards, from the end of the flattened block region, looking for assignments to the block update variable. If we find an assignment from another variable, we recursively begin tracking the other variable. If we find a number, we’re done. The flattened block always sets the block update variable to a single value (corresponding to an unconditional branch). The flattened block uses an x86 CMOV instruction to set the block update variable to one of two possible values (corresponding to a conditional branch). 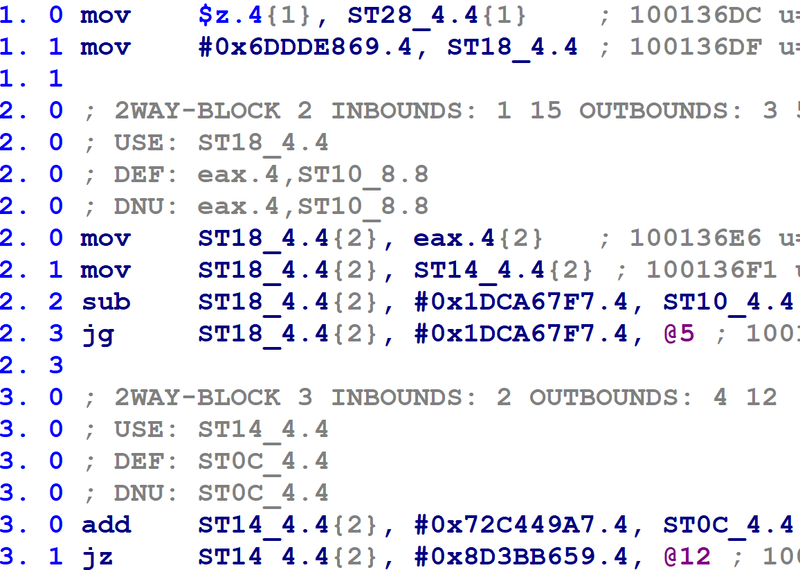 In this case, the block update variable is ST14_4.4. Our task is to find the numeric assignment on line 9.4. In concert with the flattened block number Hex-Rays mblock_t number mapping we extracted from the previous step, we can now change the goto on the final line to the proper Hex-Rays mblock_t number. Our job is to determine that ST14_4.4 might be updated to either 0xCBAD6A23 or 0x25F52EB5 on lines 6.0 and 7.0, respectively. This part of the project forced me to contend with a number of complications, some of which aren’t shown by the examples above. One complication is that a flattened block may be implemented by more than one Hex-Rays mblock_t as in the first case above, or more than three Hex-Rays mblock_t objects in the second case above. In particular, Hex-Rays splits basic blocks on function call boundaries — so there may be any number of Hex-Rays mblock_t objects for a single flattened block. Since we need to work backwards from the end of a flattened region, how do we know where the end of the region is? I solved this problem by computing the function’s dominator tree and finding the block dominated by the flattened block header that branches back to the control flow switch. Finding the numeric values assigned to the block update variable ranges from trivial to “mathematically hard”. I wound up cheating in the mathematically hard cases. Sometimes Hex-Rays’ constant propagation algorithms make our lives easy by creating a microinstruction that directly moves a numeric constant into the block update variable. A slightly less simple, but still easy, case is when the assignment to the block update variable involves a number being copied between a few registers or stack variables along the way. As long as there aren’t any errant memory writes to clobber saved values on the stack, it’s easy enough to follow the chain of mov instructions backwards back to the original constant value. To handle both of these cases, I wrote a function that starts at the bottom of a block and searches for assignments to the block number variable in the backwards direction. For assignments from other variables, it resumes searching for assignments to those variables. Once it finally finds a numeric assignment, it succeeds. However, there is a harder case for which the above algorithm will not work. In particular, it will not work when the flattened blocks perform memory writes through pointers, for which Hex-Rays cannot determine legal pointer value sets. Hex-Rays, quite reasonably, can not and does not perform constant propagation across memory values if there are unknown writes to memory in the meantime. Such transformations would break the decompilation listing and cause the analyst not to trust the tool. And yet, this part of the project presents us with the very problem of constant propagation across unknown memory writes. Here’s an example of the hard case manifesting itself. At the beginning of a flattened block, we see the two destination block numbers being written into registers, and then saved to stack variables. Later on, the flattened block has several memory writes through pointers. Finally, at the end of the block, the destination block numbers — which were spilled to stack variables at the beginning of the flattened block — are then loaded from their stack slots, and used in a conditional block number update. The problem this presents us is that we need, or Hex-Rays needs, to formally prove that the memory writes in the middle did not overwrite the saved block update numbers. In general, pointer aliasing is an undecidable problem, meaning it is impossible to write an algorithm to solve every instance of it. So instead, I cheated. When my numeric definition scanner encounters an instruction whose memory side effects cannot be bounded, I go to the beginning of the flattened block region and scan forwards looking for numeric assignments to the last variables I was tracking before encountering an unbounded memory reference. I.e., in the three assembly snippets above, I jump to the first one and find the numeric assignments to var_B4 and var_BC. This is a hack; it’s unsafe, and could very well break. But, it happens to work for every function in this sample, and will likely work for every sample compiled by this obfuscating compiler. What follows are some topics about the Microcode API that I thought were important enough to write up, but I did not want them to alter the narrative flow. Perhaps you can put off reading this appendix until you get around to writing your first microcode plugin. Chances are good that if you’re going use the microcode API, you probably will be modifying the microcode objects described in the previous section. This is murky territory for third-party plugin developers, especially those of us who are new to the microcode API, since modifying the microcode objects in an illegal fashion can lead to crashes or internal errors. To aid plugin developers in diagnosing and debugging issues stemming from illegal modifications, the microcode API offers “verification”, which is accessible in the API through a method called mbl_array_t::verify(). (The other objects also support verification, but their individual verify() methods are not currently exposed through the API.) Basically, mbl_array_t::verify() applies a comprehensive set of test suites to the microcode objects (such as mblock_t, minsn_t, and mop_t). The source code for the verify() methods is included in the Hex-Rays SDK under verifier\verify.cpp. (There is an analogous version for the CTREE API under verifier\cverify.cpp.) 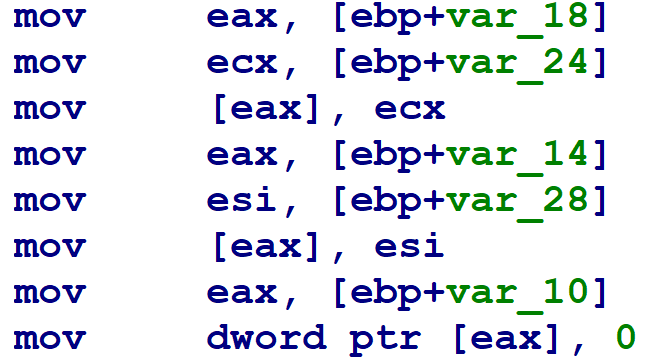 When the verifier detects an illegal condition, it raises a numbered “internal error” within IDA, as in the following screenshot. The plugin developer can search for this number within the verifier source code to determine the source of the error. The verifier source code is, in my opinion, the best and most important source of documentation about Hex-Rays’ internal expectations. It touches on many different parts of the microcode API, and provides examples of how to call certain API functions that may not be covered by the other example plugins in the SDK. Wading through internal errors, tracking them down in the verifier, and learning Hex-Rays’ expectations about the microcode objects (as well as how it verifies them) is a rite of passage for any would-be microcode API plugin developer. If you’ve ever studied compilers, you are surely familiar with the notion of an intermediate representation. The minsn_t and mop_t data types, taken together, are the intermediate represention used in the microcode phase of the Hex-Rays decompiler. If you’ve studied compilers at an advanced level, you might be familiar with the idea that compilers frequently use more than one intermediate representation. For example, Muchnick describes a compiler archetype using three intermediate representations, that he respectively calls HIR (“high-level” intermediate representation), MIR (“mid-level”), and LIR (“low-level”). HIR resembles a high-level language such as C, which supports nested expressions. I.e., in C, one may perform multiple operations in a single statement, such as a = ((b + c) * d) / e. On the other hand, low-level languages such as LIR or assembly generally can only perform one operation per statement; to represent the same code in a low-level language, we would need at least three statements (ADD, MUL, and DIV). 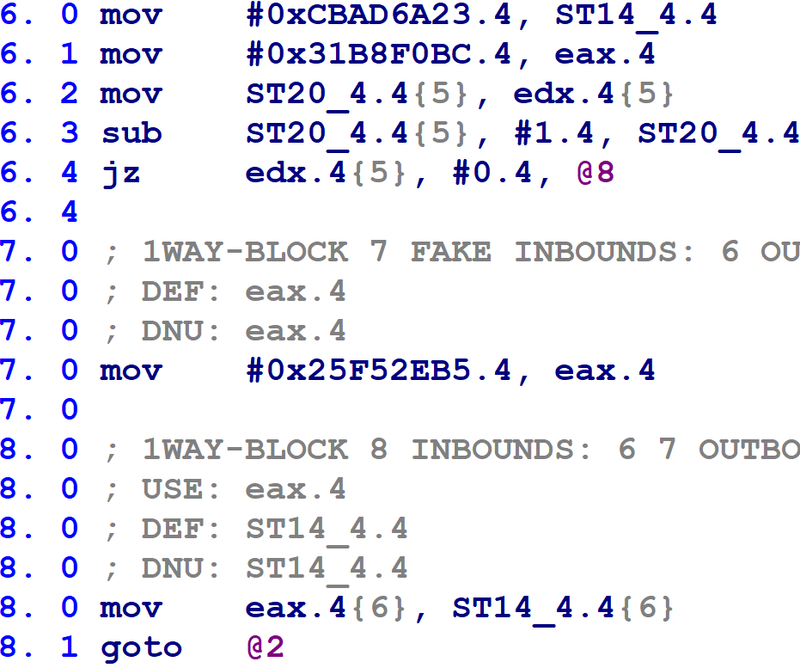 LIR is basically a “pseudo-assembly language”. So then, given that the Hex-Rays microcode API has only intermediate representation, which type is it — is it closer to HIR, or is it closer to LIR? The answer is, it uses a clever design to simulate both HIR and LIR! As the microcode matures, it is gradually transformed from a LIR-like representation, with only one operation per statement, to a HIR-like representation, with arbitrarily many operations per statement. 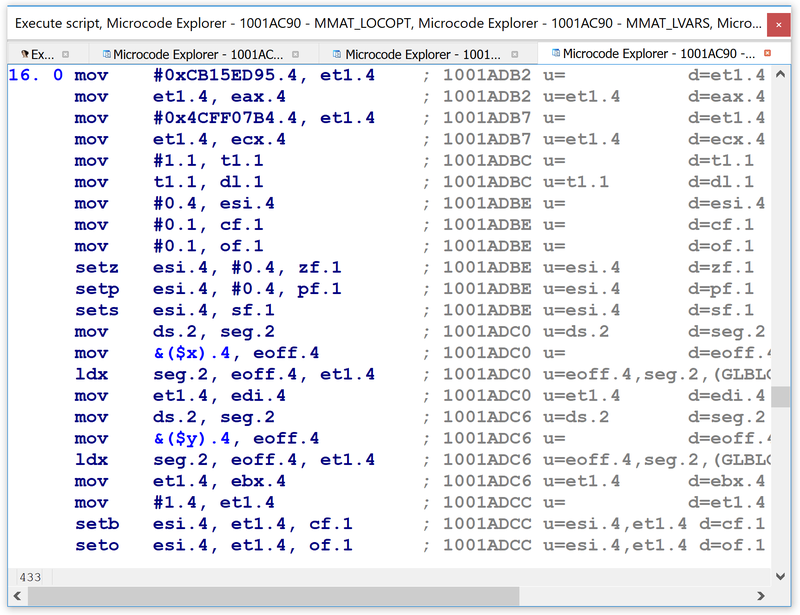 Let’s take a closer look with the microcode explorer. 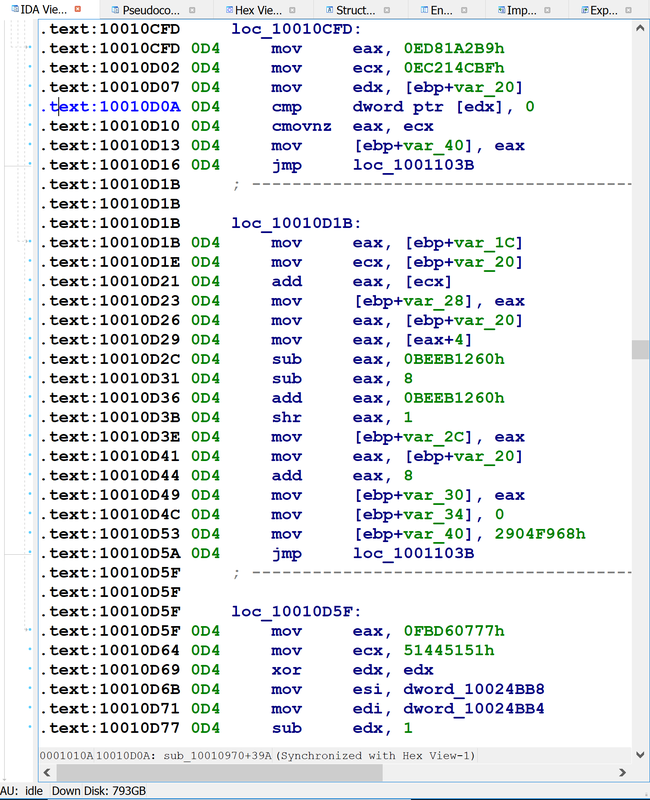 When first generating the microcode (i.e., microcode maturity level MMAT_GENERATED), we can see that the microcode looks a lot like an assembly language. Notice that each microinstruction has two or three operands apiece, and each operand is something like a number, register name, or name of a global variable. I.e., this is what we would call LIR in a compiler back-end. Shortly thereafter in the maturity pipeline, in the MMAT_LOCOPT phase, we can see that the microcode representation for the same code in the same function is already quite different. In the figure below, many of the lines in the bottom half have complex expressions inside them, instead of the simple operands we saw just previously. I.e., we are no longer dealing with LIR. That’s a pretty impressive trick — supporting multiple varieties of compiler IRs with a single set of data types. How did they do it? Let’s look more carefully at the internal representations of microinstructions and microoperands to figure it out. 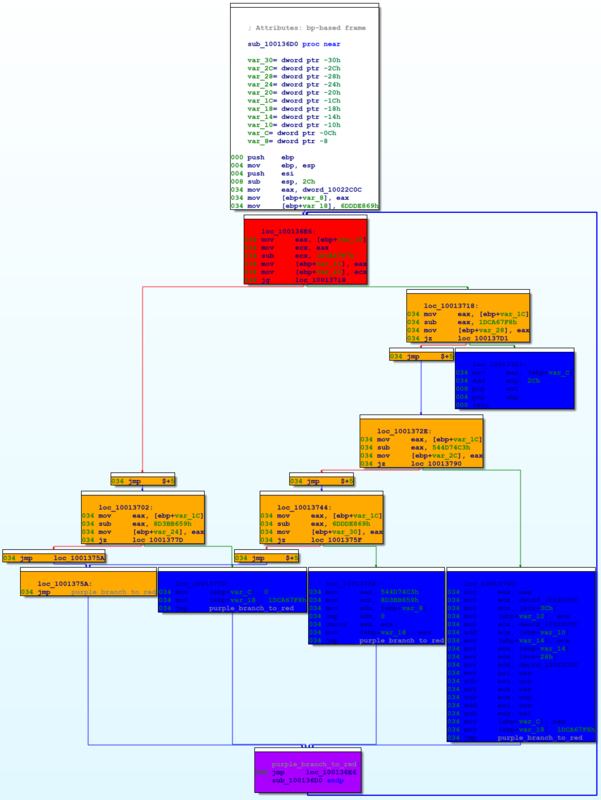 In the figure above, the top-level microcode instruction is shown in the topmost node. It is represented by an instruction of type m_and, which in this case uses three comma-separated operands, of type mop_d (result of another instruction), mop_n (a number), and mop_r (destination is a register). The mop_d operand is a compound instruction with two expressions joined together with a bitwise OR — thus, it corresponds to a microinstruction of type m_or, whose operands themselves are respectively the result of bitwise AND and bitwise XOR operands, and as such, these operands are of type mop_d, instructions respectively of type m_and and m_xor. The inputs to the AND and XOR operators are all stack variables, i.e., micro-operands of type mop_S. Now we can see how the microcode API supports such dramatic differences in microcode representation using the same underlying data structures. Specifically, the example above makes use of the mop_d microoperand type, which refers to the result of another microinstruction. I.e., microinstructions contain microoperands, and microoperands can contain microinstructions (which then contain other microoperands, which may recursively contain other microinstructions, etc). This technique allows the same data structures to represent both HIR- and LIR-like representations. The initial microcode generation phase does not generate mop_d operands. Subsequent maturity transformations introduce them in order to build a higher-level representation. The proper name for this language design technique is mutual recursion: where one category of a grammar refers to another category, and the second refers back to the first. I found this design technique very elegant and clever. Apart from using different data structures at each level of representation, I can’t think of any cleaner ways to accommodate multi-level representations. That said, this type of programming is mostly common only among people with serious professional experience with programming language theory and compiler internals. Ordinary developers would do well to study some programming language theory if they want to make good use of the microcode API.